If you started your dream of becoming a big-time graphic designer when you were young, you probably had a notebook filled with drawing and illustrations you made while watching TV or while you’re being bummed in a class. Some of you might have even had a notebook that you use as a makeshift comic book that highlights your favorite character (whether popular or someone you invented yourself) and his adventures in a land far away or what not. For those who stayed true to this hobby, they later on became full-fledged illustrators, creating comic books and manga. But unlike in the old days wherein comics and manga characters were made from sheets and sheets of paper, the dawn of digital media has allowed comic artists a more convenient way of creating comics with the use of computers and computer software. One of the most popular choices of software for creating comics and manga in the market is Smithmicro’s Manga Debut Studio. If you’re an aspiring comic artist who’s looking for a software solution to help you in your career, here’s our short overview of the Manga Studio Debut to help you figure out if this software is the best choice for you when creating the manga of your dreams. REQUIREMENTS. Manga Studio Debut 4 uses very few resources in your computer. According to the product’s website, Windows-based systems, even those that run on the much older Windows XP are supported. The software is also not that strict with hardware requirements. A computer that has a 500 MHz-800 MHz Intel or AMD processor will be able to run the program. You also just need a minimum of 256MB of RAM and 1.1GB of disk space to install Manga Studio Debut 4. If you’re a Mac user, a processor with a minimum clock speed of 867 MHz is acceptable. You also just need a minimum of 1GB of RAM and 1.1GB of disk space to be able to install and use the program. INTERFACE and FEATURES. We tried out the Windows free trial version and we have to say that it feel very familiar with the user interface having a look and feel similar to other photo editing software like Adobe Photoshop. The main work area is placed in the center while the various tools are grouped together and placed (by default) at the right side of the work space. In terms of the number of tools at your disposal, the Manga Studio Debut 4 comes with over 2,300 screen tones that are sure to add dimension and character to your art. It also has 160 pre-designed page templates to help you easily start your piece. It also provides users with familiar set of tools like pens, pencils, brushes and selection tools to allow more flexibility in designing. There’s also a collection of over 100 editable word balloons so you can add dialog and bring life to your characters. Manga Studio also has built-in Unicode support that allows users to enter text directly on the page. Users are also given the ability to sketch, ink and color their artworks from inside the software with the help of brushes and a rich selection of colors. Lastly, at least two additional add-on packages are available for the Manga Studio – the power poses add-on and the other one is the standard power templates divided into four volumes. CONVENIENCE. The Manga Studio Debut also offers numerous convenient features to aide comic artists in the creation and distribution of their work. For starters, the Manga Studio supports two ways of sketching. One would be the common way of computer sketching with the use of a mouse. And for the more experienced designer, the use of a graphics tablet. The software currently supports several models of graphics tablets including: the Wacom Bamboo, Graphire, Intuos, Cintiq and PL series to name a few. There is also an import function to enable existing sketches to be digitized and improved using the software. Once you’re done, you can then export the finished artwork in different formats. Manga Studio currently supports JPG, BMP, PSD, TGA, PNG, TIFF and PICT files for exportation. There is also an upload feature in case you want to post your manga and comics to your blog or your social networking site. 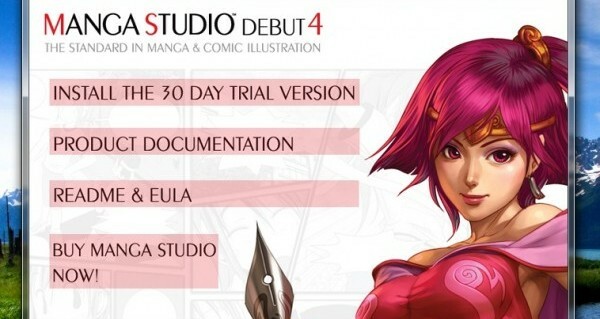 So what do you think about the Manga Studio Debut 4? Do you think its $49.99 is worth it? Tell us by leaving a comment below or hit us up on Facebook, Twitter or Google+. You can also subscribe to our RSS feeds for more designer news, features and specials straight from the You The Designer team.